Progress is being made on the shoreline-to-shoreline trail in North Hempstead, with efforts now underway for the newest segment along Hempstead Harbor in Port Washington. The trail is more than 20 years in the making – an effort led initially by Residents For A More Beautiful Port Washington and then-Town Supervisor May Newburger. Ultimately, the trail will stretch along Manhasset Bay, connecting the Town Dock to Manorhaven Park, and along Hempstead Harbor, from North Hempstead Beach Park to Roslyn. Over time, the town has been able to increase acreage and build the trails through the grant process, Supervisor Jon Kaiman said, including the newest segment along Hempstead Harbor. At that meeting the board approved a resolution awarding a $700,955 contract to Galvin Bros., a Great Neck construction firm. The project is being developed as a joint venture with Madhue Contracting in Plandome. “The trail is a great success for the town,” and is part of “a large commitment to the environment,” Kaiman said. The effort has seen success in no small part to the collaboration between the town and Residents, along with village leaders, elected officials, and volunteers. A case in point is Bay Walk, the Port Washington North portion of the Manhasset Bay section of the trail. The newest Hempstead Harbor portion will be implemented in five phases. The first two phases will comprise “an additional mile to the Hempstead Harbor portion of the trail and will include: cleaning, grubbing, leveling, designing and adding wood chips/ADA compliant crush stone walkway, wetland native plantings, benches, wayfinding signage and a boardwalk on wood piles to traverse streams,” said Residents Executive Director Mindy Germain at the July meeting. “To get the project going, Residents worked with local Boy Scouts to blaze the first fifth of a mile of this trail southward from Hempstead Harbor Park, and built an informational kiosk at the head of the trail,” she said. And, back in May, Guggenheim students and Schreiber Tree Huggers worked with Residents and the town, including Kaiman and Councilwoman Dina De Giorgio, to clean, mulch and build buzz about this trail, Germain noted. Germain thanked the town as well as members of Residents, and its founders Eric Pick and Mike Blumenfeld, for their work and vision. Also instrumental in the trail’s development are trails project leaders Dan Donatelli and Paul Stewart, and trails committee members Dawn Serignese, Bonnie Doran and Lloyd Karmel, Germain said. “When complete this trail system will increase connectivity, makes our community more liveable, improves the economy through tourism and civic improvement, preserves and restore open space and provides opportunities for physical activity to improve fitness and mental health,” she said. Mashomack Preserve Trails, Shelter Island NY is one of America’s 10 Best Seaside Trails according to the Huffington Post. Help wanted: People to maintain Long Island’s hiking trails. No pay, and opportunities for cuts and bruises and picking up insect bites, but plenty of fresh air and exercise. The nonprofit Long Island Greenbelt Trail Conference isn’t really putting out ads like this for more volunteers to maintain the 150-mile Island trail network. But it does need more bodies. Parks agencies in the past had been able to do a lot of trail maintenance. But “lately they are so understaffed and overworked” because of budget cuts that volunteers have been required to do almost all the work, said Nancy Manfredonia, former president of the conference and organizer of an event Sunday at the Trails Information Center in Manorville to acknowledge those who volunteer and try to find more people to pitch in. “We’ve logged over a half-million hours of volunteer work” over the 34-year life of the organization, Manfredonia said. “We want people to be able to enjoy their hiking experience” so overgrown trails have to be kept wide enough that hikers don’t have to worry about ticks and Lyme disease. While the organization has 1,200 members and draws many guests on its hikes, it has only about 50 trail maintainers. “We probably need 200 to do a thorough job,” Manfredonia said. Being a trail volunteer “only entails a love of the outdoors and the ability to clip back the vegetation,” she said. Nancy Duffrin of Shoreham, a trail maintainer for more than 15 years, leads a crew of about 25 volunteers who spend three hours on Mondays sprucing up the western portion of the 125-mile Paumanok Path, which runs from Rocky Point to Montauk Point. The retired Stony Brook University administrator said the group uses a brush mower, a regular lawn mower, loppers, hedge trimmers and bow saws. “We’ve learned how to protect against ticks pretty well” by using a spray on their clothes, she said. Bill Raftery of East Islip, an electronics manufacturing firm employee and volunteer since the mid-1990s, uses an ax to clear fallen trees on the Nassau-Suffolk Trail in Cold Spring Harbor State Park. “It’s good exercise and I get thanks from everybody who uses the trail,” he said. The only downside: “a couple of blisters.” Being a trail volunteer “only entails a love of the outdoors and the ability to clip back the vegetation,” she said. Click here for the trail maintainer application & to see what sections are available. Climate change is already adversely affecting seven national seashores on the Atlantic Coast, from Cape Cod to Cape Canaveral, and those impacts will dramatically worsen if heat-trapping pollution is not reduced, according to a new report from the Rocky Mountain Climate Organization (RMCO) and the Natural Resources Defense Council (NRDC). Titled “Atlantic National Seashores in Peril: The Threats of Climate Disruption,” the RMCO/NRDC report contains the first set of maps detailing the portions of Atlantic national seashores that are low lying enough to be at real risk of being submerged by rising sea levels. Other climate change impacts outlined in the report include the loss of bridges and roads that provide access to the seashores, breakup of barrier islands into smaller segments, extensive beach erosion, and loss of wildlife. The RMCO/NRDC report documents that Fire Island National Seashore (NS) in New York, Assateague Island NS in Maryland and Virginia, Cape Hatteras NS and Cape Lookout NS, both in North Carolina, and Canaveral NS in Florida, all have a majority of their lands less than one meter (3.3 feet) above sea level, and therefore are at serious risk of inundation by a higher sea level. Also at risk to higher seas are particular sections of the remaining two national seashores covered in the report: Cape Cod NS in Massachusetts and Cumberland Island NS in Georgia. Scientists say there is a good chance that a hotter climate could push seas at least one meter higher in this century. The report notes that the Cape Cod, Fire Island, Assateague Island, and Cape Hatteras national seashores already are experiencing rates of sea-level rise well above the global average. Another concern is rising temperatures that could discourage summertime visitors. New climate projections included in the report show that, with medium to high emission level, the late-century summer temperatures at Fire Island NS could average 6.5 degrees higher, as hot as those experienced today in Atlantic Beach, NC, and temperatures at Cumberland Island NS could rise 6.3 degrees, matching the current summer climate in desert-bound White Sands National Monument in New Mexico. The seven national seashores draw a total of about 11 million visitors a year, contributing to the economy of seven states by generating more than half a billion dollars in spending and supporting nearly 8,000 jobs. An additional, immeasurable economic value of the seashores is that they contain islands, dunes, and other shoreline features that are the first line of defense protecting human populations and developments from the often devastating effects of winds and surging flood waters from hurricanes, nor’easters, and other coastal storms. * Fire Island NS, located only 40 miles from Manhattan, has most of its land one meter or less above sea level, primarily on the inland side of the island. Based on projected wave height, susceptibility to erosion, and tidal range, Fire Island has a high vulnerability to shoreline change from sea-level rise. See the full report for other impacts. * Actions by the National Park Service to identify and protect threatened seashore resources and to reduce its own emissions of heat-trapping pollution, combined with visitor education exhibits and programs on climate change threats and examples of emission reduction efforts. With 279 million visits in 2011, the national park system can play a unique role in presenting climate change information to people. Filled with a wealth of activities and attractions, New York’s , commute just got easier. Promoting a healthy living and environmentally friendly DecoBike has put its bike’s in the big apple. DecoBike, is currently the first bike-share program in the state of New York, DecoBike’s partnership with the City of Long Beach. New Yorkers can now get from point A to Point B by simply renting a DECOBIKE for periods at a time. Launching this week DecoBike brings you a true Long Beach lifestyle option – a bike. Allowing tourist to live like a local, by cruising from the train to the boardwalk, and then to beach, on a comfortable beach cruisers. DecoBike allows you to take advantage of the 2.2 miles of boardwalk or move beyond the boardwalk into the various neighborhoods of Long Beach as you ride in style through the City by the Sea. With kiosks conveniently located throughout the City, it’s an easy, economical and exciting way to enhance your summer experience. Ride one way or round trip to a myriad of destinations and enjoy life like a Long Beach local. With a variety of pricing options to meet any rider’s needs, the possibilities are endless for a stupendous riding experience in Long Beach. Staffed by a knowledgeable and experienced team of Long Beach locals, DecoBike offers riders a true Long Beach experience. “As a life-long Long Beach resident, I feel fortunate to live and work in such a beautiful part of the world. Some of my fondest memories are of my riding my bike through town with my mom or my friends. I am excited to be working with a company that will offer this experience to the hundreds of thousands of individuals who visit our city each year,” said Richard Chimienti, Manager of DecoBike, Long Beach. In a challenging economic time, DecoBike has used its local-mindedness to put Long Beach locals to work. “It’s important for DecoBike to become a contributing member of the Long Beach community. This City has given so much to us and we are fortunate to be able to give back in a unique way now. Having the opportunity to hire so many young people from Long Beach as part of the DecoBike team allows us to invest not only in our residents, but also demonstrate the benefits of a healthy lifestyle to our guests as well,” said Pierdant. The forecast is heating up. 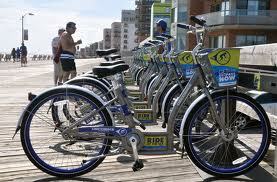 Why not head to the beach and enjoy the Long Beach experience like a local – on a DecoBike. DECOBIKE, LLC debuted their revolutionary public bicycle sharing and rental program in the world-famous South Beach Art Deco district as the country’s first green city-wide public transit program, starting in March 2011. In 2012, they have expanded to Surfside, FL and New York giving locals and tourist the chance to live and healthier lifestyle. For more information, please visit our website at www.DecoBikelbny.com.